Super OLED was supposed to be the branding for Samsung's OLED TVs launched at CES 2012, but Samsung never released any Super OLED TV, and they changed the branding in early 2013 to Real OLED TV - which was not used also. 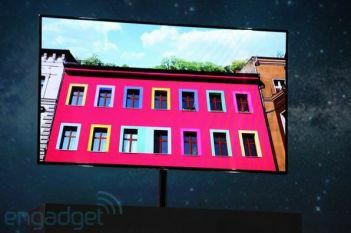 Samsung focuses on the fact that they are using 'True OLED' RGB subpixels, as opposed to LG Display's white subpixels with color filters architecture (WOLED-CF), and also to differentiate its OLED TVs from LED TVs. Samsung's design theoretically means better quality image and a more efficient display, while LGD's design should enable them to manufacture the TVs on the cheap. The only Super OLED TV was the 55" ES9500, which was never released commercially.